We offer a Conveyancing Service that enables us to significantly reduce conveyancing time frames. We strive to deliver the best possible in-house legal service to our clients and we have a dedicated team on hand to provide you with a friendly, transparent and professional service. They have in-depth industry knowledge and are committed to offering you an outstanding service. We pride our service on being transparent so you will know exactly what you are expected to pay to enable you to budget accordingly. There are no hidden costs and if the transaction does not proceed to completion, there will be no fee for the legal services, giving you complete peace of mind. We work with a carefully selected panel of local solicitors, our case work is prioritised and both ourselves and our clients are updated when key milestones have been reached which ensures a smooth fully informed customer experience. We ensure that all of our solicitors on our panel work to strict Service Level Agreements which is key to getting our clients sale or purchase completed faster. We provide you with a Search Pack Guarantee in the unfortunate situation that your purchase falls through and searches have been ordered. This means we will provide a second set for absolutely free on any new purchase bought within the following 6 months. 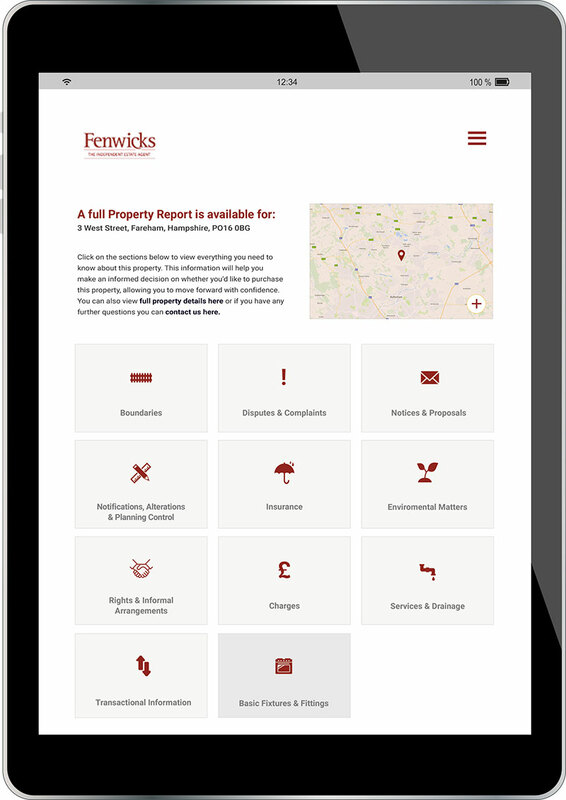 All of our Property Reports include all the information that would usually be found in the Property Information Questionnaire and fixtures and fittings form. We invite sellers to complete this form via our user friendly system at the start of the sale process and confirm the information with an e-signature. Law Society forms are then generated and stored on file ready for when the property is sold. This means that draft contracts can be sent out much faster than in a traditional sale, speeding up the sale process where no chain is involved. We then link the Property Report to the property details so that buyers have instant access to all of the information they need to make an informed decision on the chosen property, allowing them to buy with complete confidence. Our Property Reports enable us to significantly speed up the Conveyancing process and reduce fall through rates.